This is one of the best models of aquarium heaters you can buy today on the market. The brand that makes this aquarium over the years has provided some of the best models and now this one. It can be taken as if the manufacturer over the years took the complaints of the previous models and made this model to be better. Starting with the installation, you will find that this model gets much love for being easy to get it done. It is a straightforward process that should get you done in a few minutes even if you are new to using the heater. If you want to install the model, start by shutting off the mains water supply to the aquarium before connecting the heater. It is always easier to work with pipes that do not have water dripping out all the time. A number of videos exist online which you could use to do the installation part. 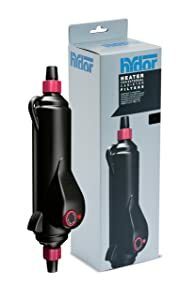 Many people who often find themselves stuck at the installation part would use the videos to get them done with the installation of the heater. After you done, double check the pipes to avoid cases of water leaks in the future. It is crucial to have a model that would be easy to use. It is what you get when it comes to using the model. The temperature control on this model has been made easier with the temperature knob at the bottom of the heater. You can raise or lower the temperature easily with this knob. The temperature range varies from 62 to 94 degrees F.
With just a few controls on the model, then you should have an easy time controlling the model. You will no longer have to worry about dealing with complicated systems or controls as it might be found in other aquarium heaters. The design of this heater makes it impossible to see the inside and judge whether it is clogged or not. It is why you may want to get this heater fitted on the return line only. This minimizes the chances of the heater being exposed to the water going to the filter for the filtration process. This also keeps the clogs to a minimum as the heater gets to heat the cleaned water. As for the maintenance, it should be easy taking apart the heater and checking what is the issue. This might not always happen as many people who have used it agree that it can be maintenance free for a long time. The model will deliver an impressive heating capability depending on the type you get to choose. For this review, we get to look at the 300-watt inline aquarium heater. It should be able to keep up with 100+ gallon aquarium with ease. It will keep it heated to the right temperature that you need.